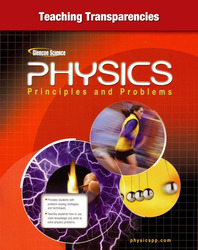 Address major concepts introduced in Physics: Principles and Problems with these helpful Teaching Transparencies! Several transparencies are provided for use with every chapter of the Student Edition. Use them to introduce, reinforce, and review concepts. They're also ideal for students who will benefit from an additional visual learning aid!